You can implement my ideas perfectly at a New Year’s day brunch. Or on the day after Christmas as a late breakfast. 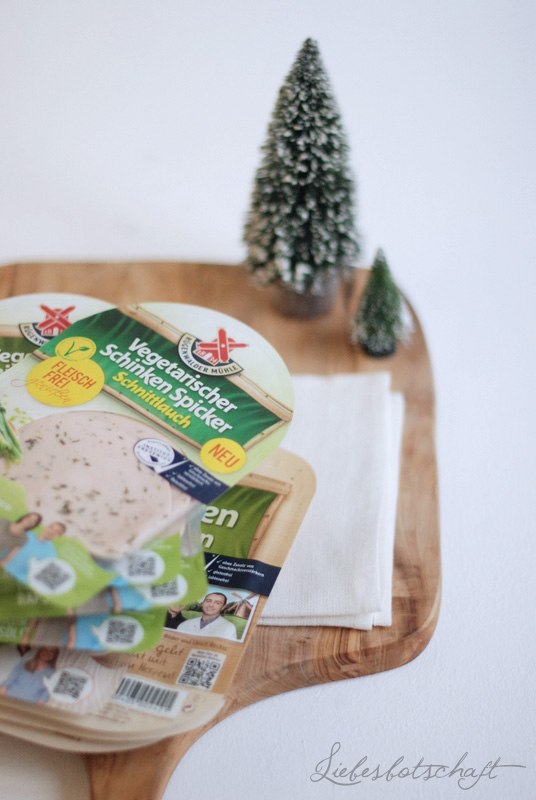 This time the cold cuts as well as the ham (Rügenwalder Mühle Schinkenspicker) that I used are all vegetarian – featuring the usual quality, without flavor enhancing ingredients, colorants or gluten and 100% free of lactose and meat. With regard to taste, however, you cannot distinguish them from real cold cuts! I realized all recipes entirely with the vegetarian varieties, but naturally you can opt for any other ham or cold cut variety, depending on your preference. 1. 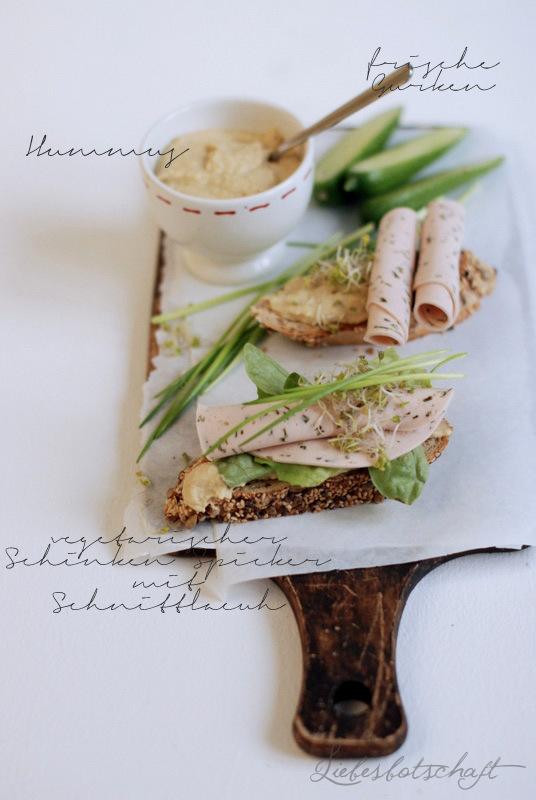 Toasted whole wheat baguette topped with home-made hummus, leafy greens, vegetarian ham with chives (Rügenwalder Mühle Schinkenspicker) and fresh cucumbers. 2. Toasted Ciabatta topped with arugula, vegetarian Mortadella (Rügenwalder Mühle Schinkenspicker), and a tomato-basil salsa. This is accompanied by some buffalo mozzarella drizzled with highest-quality olive oil. 3. 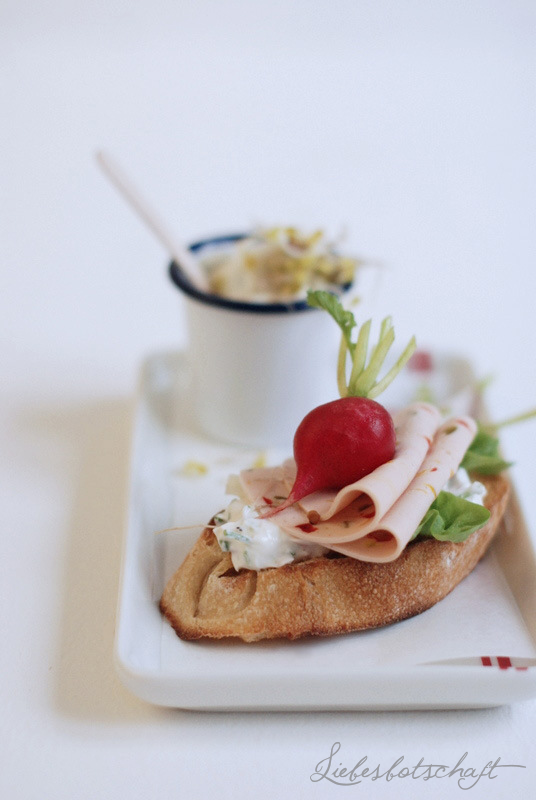 Toasted pretzel baguette with a home-made herbed quark/Greek yogurt and topped with vegetarian ham with colorful bell peppers (Rügenwalder Mühle Schinkenspicker) and fresh radishes. Mix everything in a blender and season to taste. 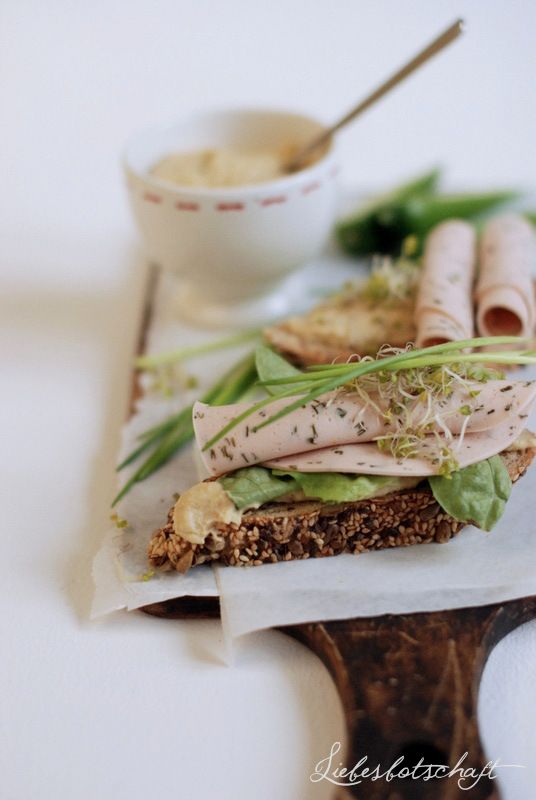 Toast slices of bread (toaster or oven grill), spread with hummus, top with salad leaves and the vegetarian ham with chives, garnish with sprouts. Place a small bowl of hummus on a small wooden board and serve with freshly chopped cucumber. Cut the tomatoes into quarters, chiffonade the basil, mix both with olive oil and season. 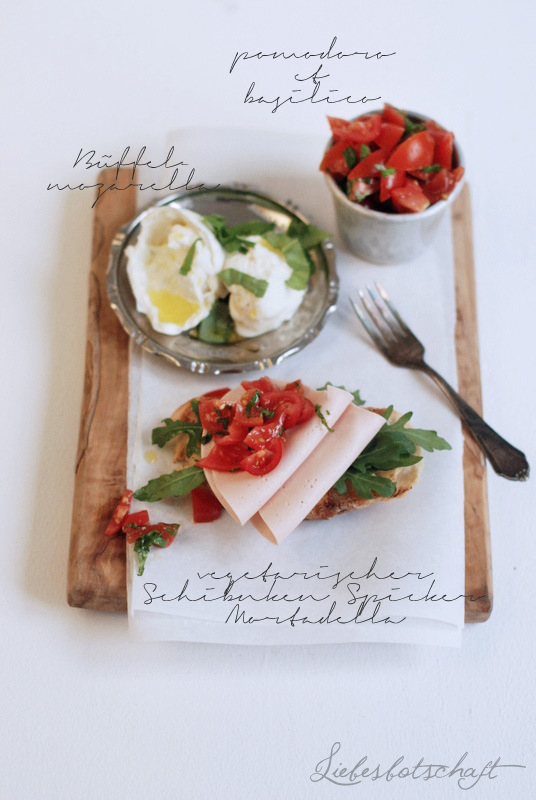 Toast slices of ciabatta, top with arugula and vegetarian Mortadella (Rügenwalder Mühle Schinkenspicker),as well as tomato salsa. On a small plate lightly cut up half a buffalo mozarella, drizzle with olive oil and sprinkle with fresh basil leaves. Serve the rest of the tomato salsa at the side along with a small fork. 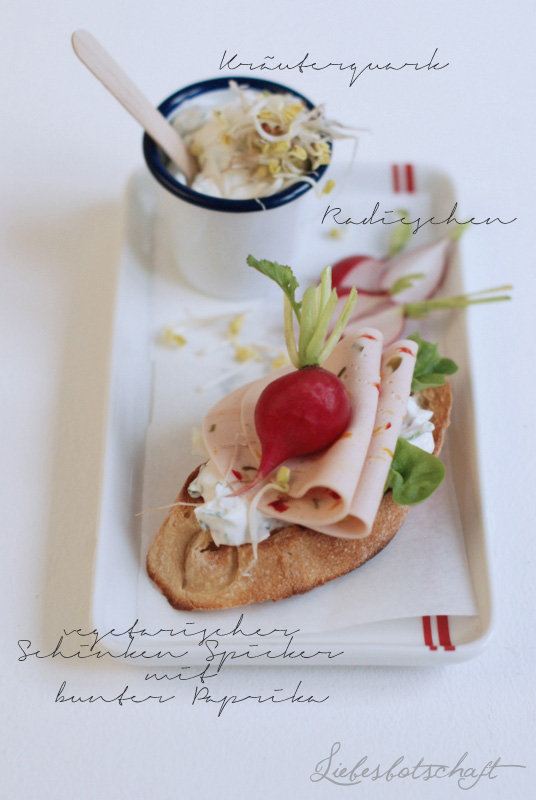 Toast pretzel baguette, spread with herbed Quark/yogurt, top with salad, vegetarian ham with colorful bell peppers(Rügenwalder Mühle Schinkenspicker), and radishes. Serve alongside some extra herbed yogurt and radishes. 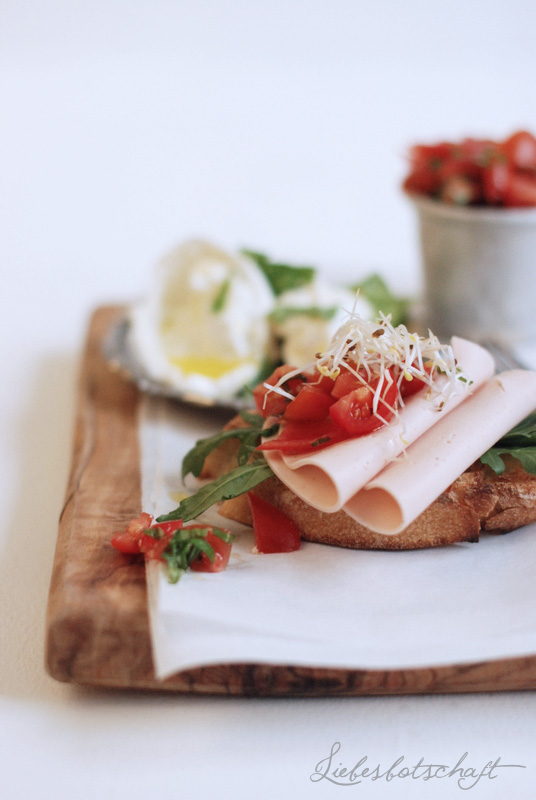 Would you also like to try the vegetarian cold cuts – or even one of each of the whole assortment? Then this is the place to be, as I, together with Rügenwalder Mühle, will give away 4 cold cut parcels, each at a value of 25,-€. They can be entirely compiled of vegetarian cold cuts, or you can add smoked sausages, or try all kinds of ham varieties – whatever your heart desires! 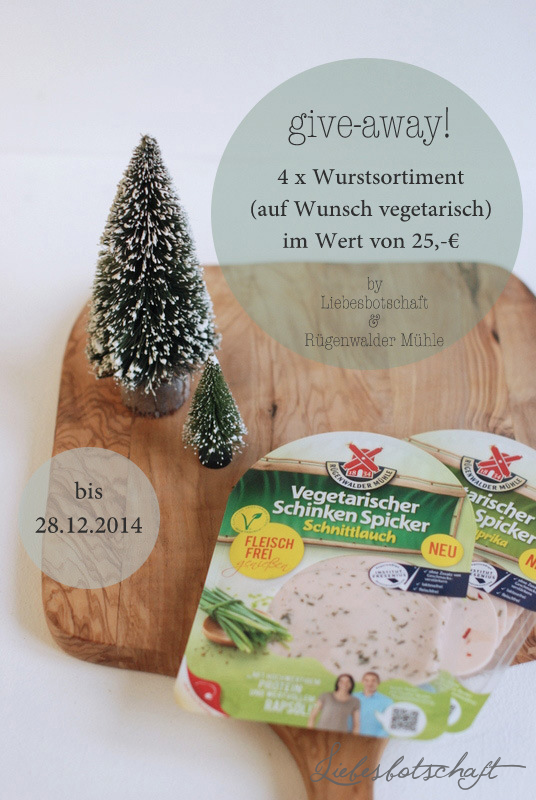 Which Rügenwalder Mühle product should definitely be part of your cold cut parcel? Please use hashtag #liebesbotschaft to do so and mark me on the picture – otherwise I will not be able to see it. You can do this quickly and simply: HERE. The competition starts now and ends on December 28, 2014. Congratulations, please send me a mail! Thank you for translating this post, Eva Ginnell!